Marine Finance. Professional assistance in obtaining the best rates and terms, tailored to your specific needs. 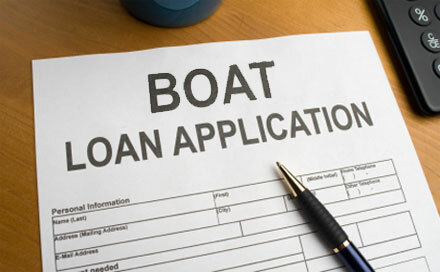 We have a full array of lenders dedicated to the marine industry. Let us show you how affordable boat ownership can be! Coast Guard Documentation. A very nice tax advantage if your boat qualifies - let us tell you how! Our service is licensed and bonded to protect you from title or chain of ownership defects. Missouri State Registration. We obtain your State Registration stickers and make sure you have a Temporary Permit to keep you legal on the water at all times. Closing Services. Decided to buy your boat from a broker or an individual? We offer closing services to take the guesswork our of proof of ownership, transfers of ownership, and lien pay-off on a private sale, and can assist with your finance and insurance, too! Marine Insurance. Don't guess whether or not your boat or yacht has sufficient insurance coverage in the event of an accident or act of nature - depend on it with our carefully selected insurers who specialize in marine insurance products and have the experience to know your needs. Contact us for your free quotes today!